Dad was the cook in the family, not because he liked to cook—he just wasn’t interested in carrot juice, cod liver oil, or plain yogurt that my mom ate and fed to us three kids. She was so dedicated that my baby brother had an orange tint to his skin from drinking so much carrot juice in his bottle. When we were lucky enough to have my dad around (he traveled a lot), he actually cooked “regular food”. He wasn’t a bad cook, but it wasn’t until I left home that I discovered that barbequed chicken wasn’t supposed to be black. One summer when I was home for a couple weeks, I filled a big bowl with lettuce, celery, cucumber, and tomatoes, then topped it with half an avocado filled with tuna. I took the peanut butter jar out of the fridge, poured it over the salad, popped a beer and headed out to the patio. The sun was shining. I had the house to myself, a paperback under my arm, perfect setting for some quality time with my lunch and my book. I sat down, and with the first mouthful realized I had covered my salad with my mother’s cod liver oil. The dressing for this fruit salad is unusual too but in a good way. 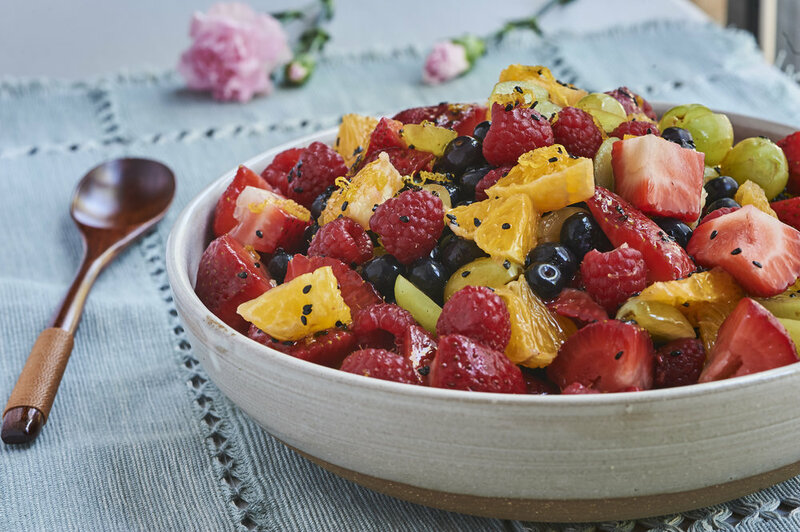 Most fruit salads don’t have dressing at all but the poppy seeds give this salad an unusual crunch along with the crisp green grapes and the juicy berries. Perfect for a picnic or just lunch on the patio with your favorite book. His omelets were good though, light and fluffy. He also made killer salad dressing. Many of my parents friends asked for the recipe, but he never shared it. Not because the dressing was so very unusual but because my dad changed it depending on what we had in the kitchen at the time. Whenever I opened my parents refrigerator there was always an old peanut butter jar of his dressing on the shelf. Wash and dry all the fruit and place in a large bowl. Set aside. In a small bowl whisk the oil and honey together. Add the poppy seeds and zest and pour over the fruit. Mix until the seeds are evenly distributed. At this point you can chill it for an hour or serve it right away. This dish is best the first day.